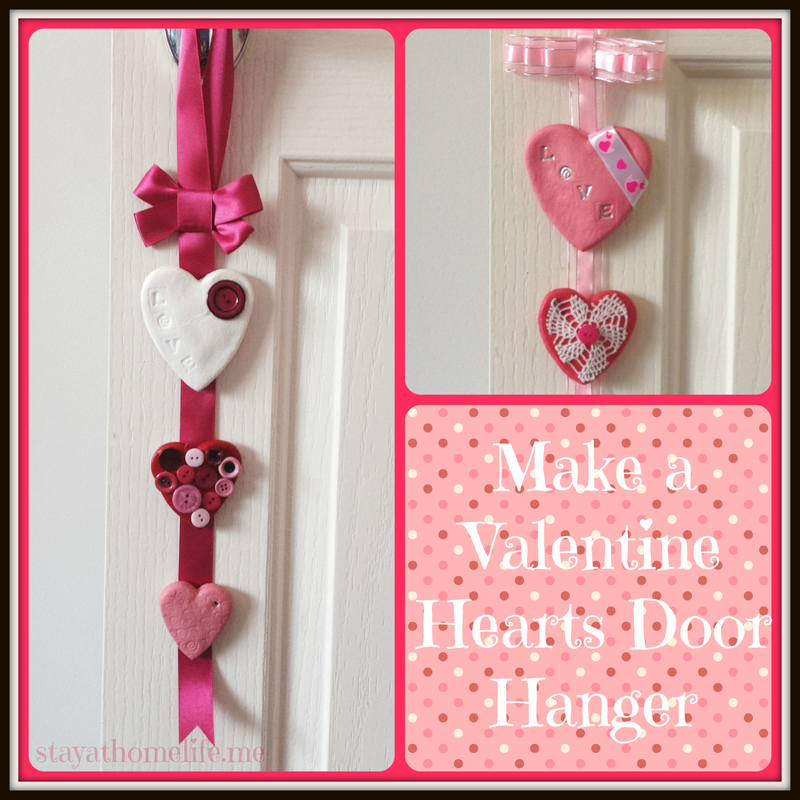 Valentine Craft, Love Heart Door Hanger. 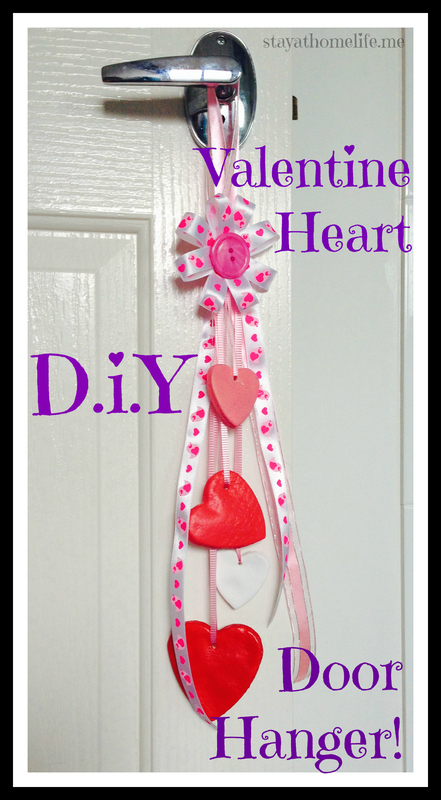 We made 2 different variations of valentine door hangers, but both styles use the same materials. The hearts are made from salt dough, the same as those DIY Christmas ornaments you see all over Pinterest. There is plenty of recipes and methods available online. The bows are a basic bow that again you’d see on Pinterest. There is hundreds of bow tutorials all over the internet too, but I kind of made it up as I was going along. Mix all ingredients as you would biscuits, using some extra flour as necessary along the way to stop it sticking. Roll out 7mm thick, cut into shapes then bake at 120C for 2.5 to 3 hrs. Once cooled, we painted them with craft acrylic paint. The top bow feature for this one was made by cutting 4 equal lengths of ribbon, putting a small line of hot glue in the centre of one at a time, folding each end into the middle to create a single bow shape. Then doing the same with the next ribbon, pilling them up as I went. You can see this in the photos. Finished off with a button. Then it was just a case of threading the hearts, adding some extra ribbons and glueing all together at the back. fold in each end onto the glue strip. 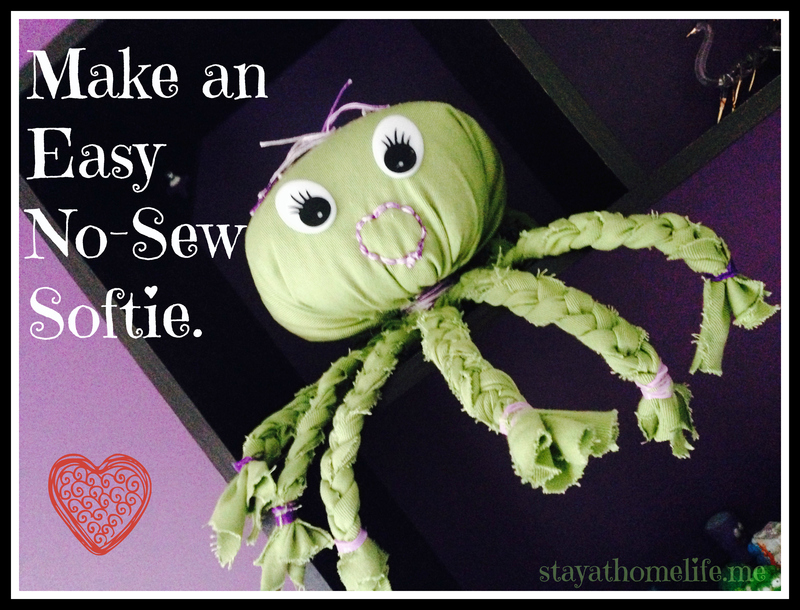 Sew-less Softie. 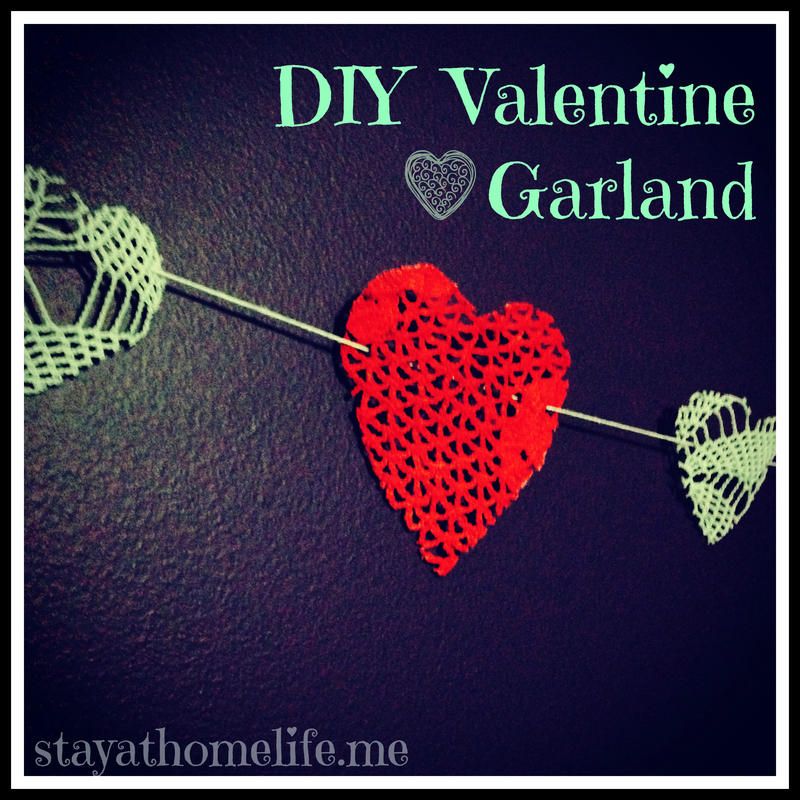 Easy Craft Project. This was one of those moments I love, when something just pops into your head and you think ‘yes, yes, yes I know what we’ll do!’ and it WORKS! Originally it was supposed to be an octopus (8 legs) but Mr3 is calling it a spider and I think it looks a bit like a jellyfish, so what ever floats ya boat I suppose! Mr8 chose green fabric, but I really wish we had used something a bit more fun. The purple and white string livens it up a bit though. Just run over or click on each photo for the steps. Trace out a large outside circle and a smaller inside circle. We used a hula hoop and large saucepan lid. Using a ruller or similar, make 8 sets of 3 lines around the middle circle as shown. If they cross over a little, just split the distance as seen in picture. then cut the strops, leaving you with 24 strips around the centre circle. Release the stuffing and insert eyes (you need to access the back of the fabric to fasten these type of eyes. Stuff again and temporarily secure with a rubber band. Add any extra stuffing to achieve desired shape and feel. Once you’re happy with the body, go over the rubber band with something more permanent. Plait the legs, I secured with more rubber bands, but you could use matching string. Then it is just a case of decorating to make it the creature you want. I threaded some large loops through the head. Then cut them in half and tied to each other to secure. I also hand stitched a mouth in, but if you are not handy with a needle and thread, you could just use a permanent market or glue a button etc on instead. This little piggy went to market… And this little piggy just wants to play in the garden! How cute is this? 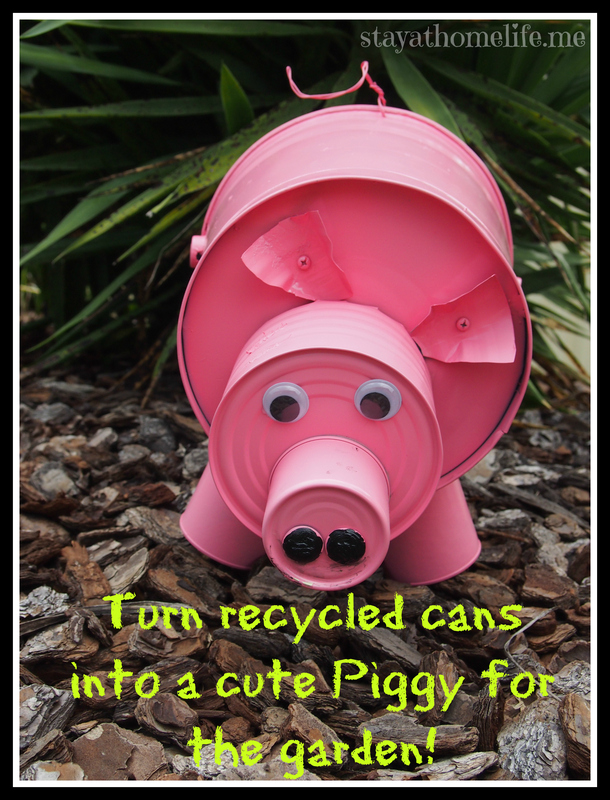 Made from recycled cans and a tin bucket, some pink paint, wire and a few screws! 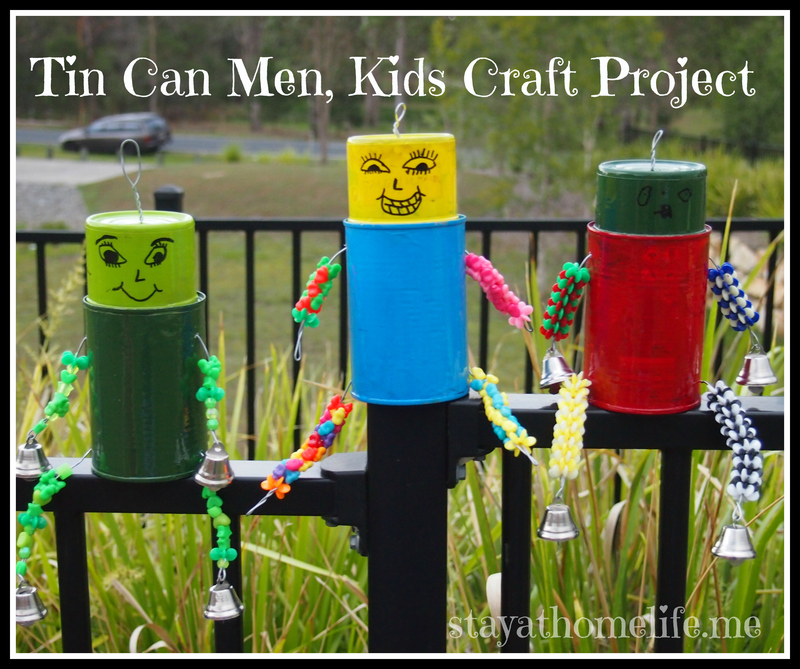 The assembly process was very similar to the Tin Can Men from a few days ago. You can see how they did it in the pictures below. I want one! This clever school holiday project is bought to you by All Tizzied Up. If you are in Australia and in need of some bows, check out their page. Valentines day is not a huge thing here in Australia, like Halloween (we obviously don’t have Thanksgiving or 4th of July celbertons either) but it is one bandwagon I am willing to get on for the craft side of things at least. Also willing to accept all donations of fine jewellery and flowers, lol. I originally wanted to make these 3D, but I couldn’t work out what to use as a frame for them that could be removed late (like a balloon), so I just went with flat ones. The whole things was a bit of an experiment for me too, as I have never played with liquid starch before (took me 6 months to even find it). The white ones I just used straight starch, and the red ones I used a corn flour and starch mix, roughly 50/50, with a dash of food colouring. The ones with the corn starch turned out much firmer, but the white ones were still firm enough to work with. Once completely dry, I traced out heart shapes with a black marker using cookie cutters. Cut the shapes out with sharp scissors and threaded them up – ready to hang. Corn starch, (corn flour) Liquid starch, food colouring, doily or lace. Demonstrating how firm the dried product is. Trace out shapes on back side, cut out. 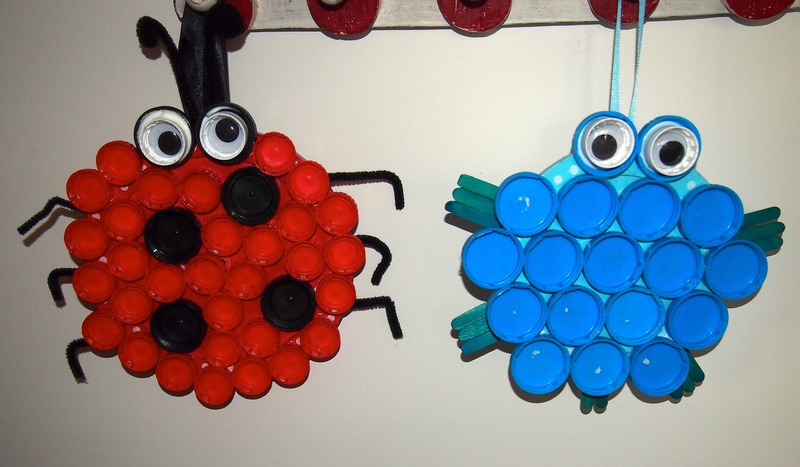 Here’s a cute fine motor activity for the little ones using recycled objects from around the home. Made by All Tizzied Up over the school holidays. Hover over or click on the images below for more details. 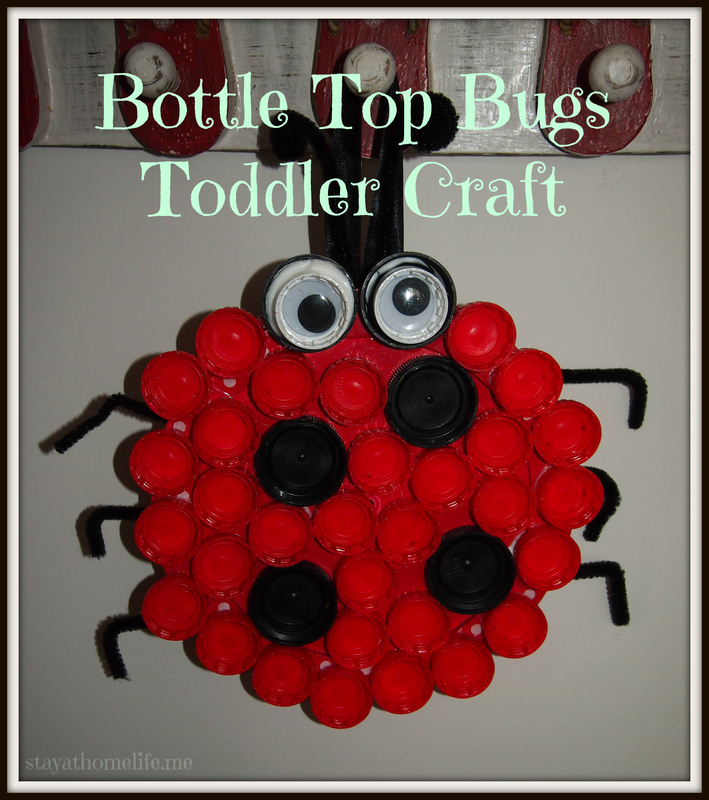 Glue goggly eye into caps at the top.